Over the years, the Hand-Knotted Kashmir Silk Carpet has been an indomitable and priceless treasure which the carpet connoisseurs have bought into their homes. The element of luxury with which a Kashmir Silk Carpet is associated today is a marked contrast with its humble beginning among the nomadic tribes that once wandered the great expanse of Central Asia. The history and development of the carpet industry in Kashmir has been associated and influenced by the opulent lifestyles of its rulers and the aristocracy. The carpets were introduced into Kashmir in the 1400's and over the years the artisan there have developed various deigns, motifs, patters and decorative styles unique to Kashmir such as Shalimar, Shah Abbas, Star of Kashmir, Shikar-Gah and Pezli. 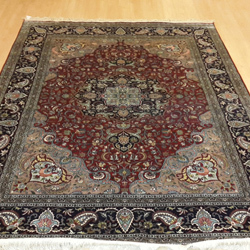 We also have a large collection in the Persian style such as Kashan, Bhaktiyar, Kum and Isfahan. These come in various rectangular sizes which can be used either as centre pieces or as runners. The Oriental Hand-Knotted Wool Rug Carpet is an alternative to the Silk Rugs. Compared to the silk rugs these take much less time to make and the designs are not as intricate as in the silk rugs. 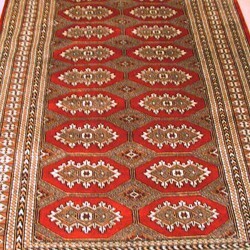 The yarn used to make these carpets is usually fine Bikaner wool which gives a good sheen on the rug. These come in various rectangular sizes which can be used either as centre pieces or as runners. Hand-Tufted & Hand-Loom carpets are very durable due to the right balance of the fibre used, yarn twist, pile height and the density. They are usually made from a variety of combinations of fine Bikaner wool and New Zealand wool. They are also made of Viscose which gives a shiny silk type effect to the carpet. These fibre are naturally fire retardant, especially wool which extinguishes itself when removed away from the flame. The yarn is also organic and renewable as wool is a natural produce and sheep are sheared annually for its wool. A high pile carpet also improves the acoustics of the room. 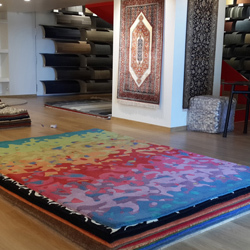 We provide a large range in hand-tufted and hand-loom construction in rugs and also in wall to wall carpets. These Polyester Shag Rugs usually have a Hand-Tufted construction and could also be in Hand-loom variety. These rugs come in contemporary designs and vibrant colours. 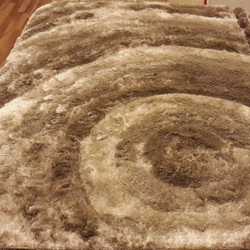 You could choose from a range of high pile or extremely high pile polyester shag rugs of either a thin yarn or thicker yarn.